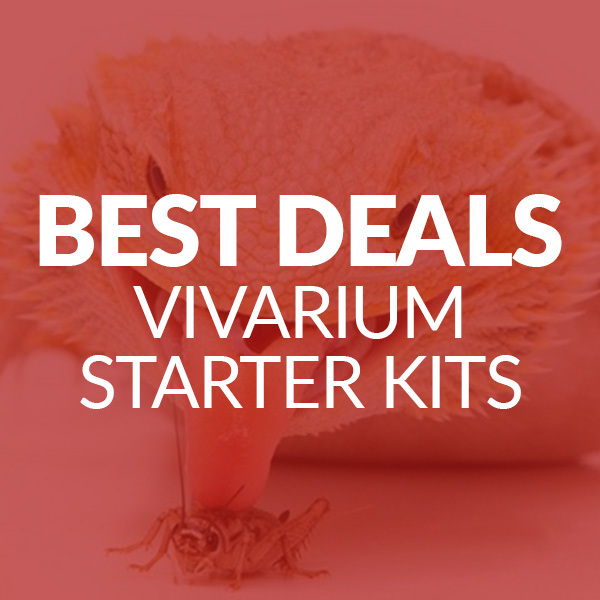 Calling all bearded dragon owners! 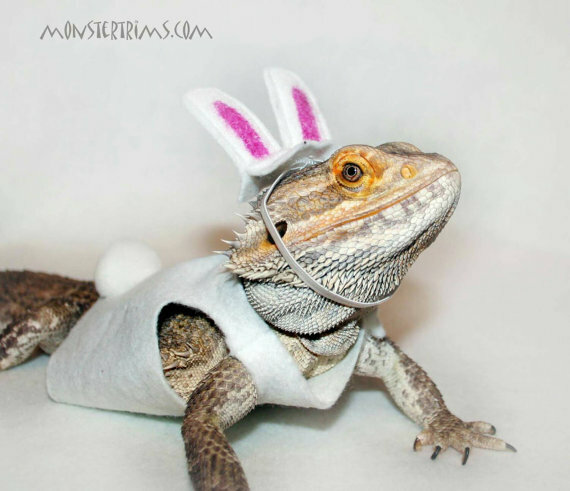 If you don’t think your beardie could get any cuter than he/she already is, check out these adorable bearded dragon outfits! From Princess Leia and Yoda to bearded dragon Halloween costumes (yes, they exist! 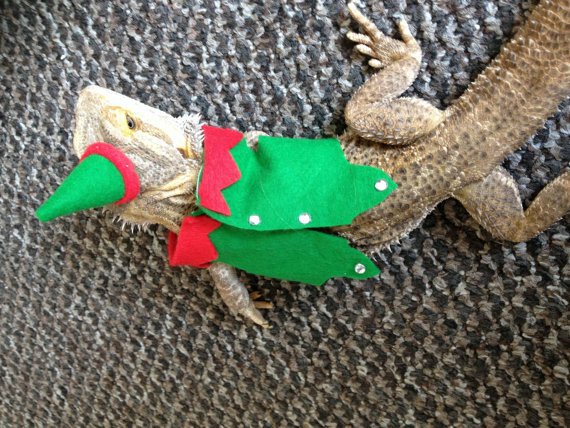 ), they’ll leave you wondering why you’ve never dressed up your bearded dragon before! Have a scroll through our favourites below and remember that these bearded dragon costumes are all available on Etsy (and they’re super affordable) so there’s no excuse not to treat your beardie to a little outfit or two! 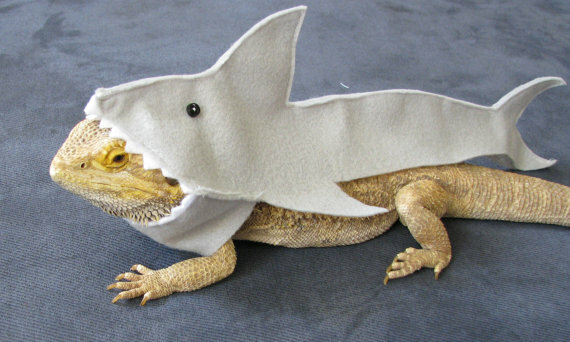 Let’s start with a firm favourite – the great white shark bearded dragon costume! You’ve probably seen this one knocking around on Pinterest and we have to admit it makes a super cute photo! (Pick yours up here). Great White Shark Costume for Bearded Dragons! Shown on Discovery's Shark Week!!! 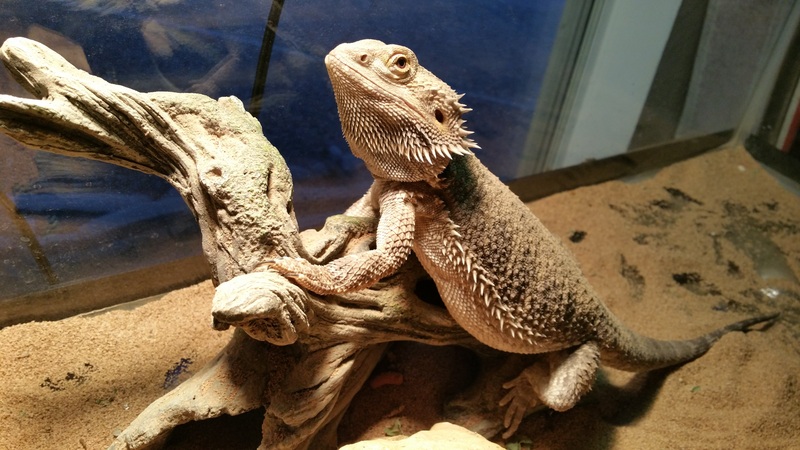 Own a couple of bearded dragons (specifically a male and a female?) 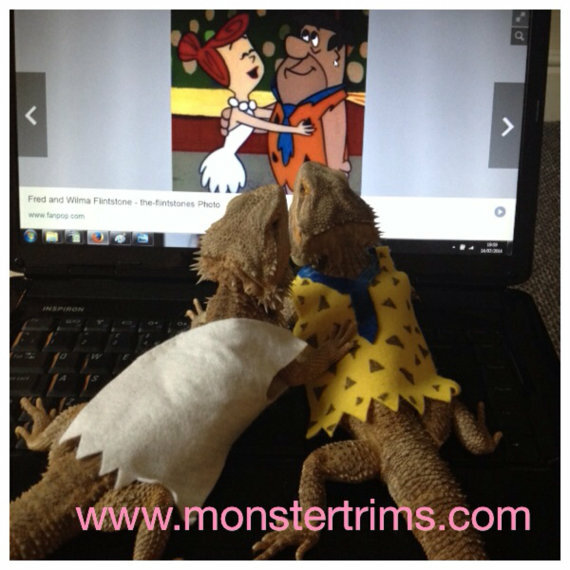 They’ll have a yabba dabba doo time in these adorable Flintstones outfits and look like they’ve rolled straight out of Bedrock! 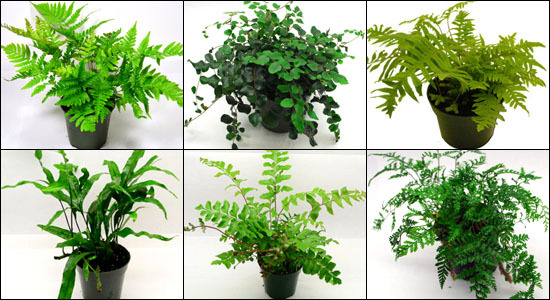 (Pick yours up here). Yar har me hearties! This pirate costume is perfect for bearded dragons with a mischievous streak and you don’t have to sail the seven seas to get one (just pop over to Etsy). 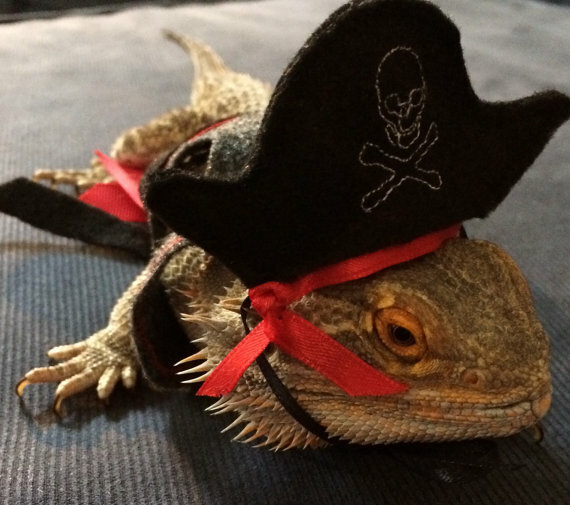 Felt Pirate Costume for Bearded Dragons. Hat and vest. Now 2 colors! There seriously is a bearded dragon outfit for every occasion. 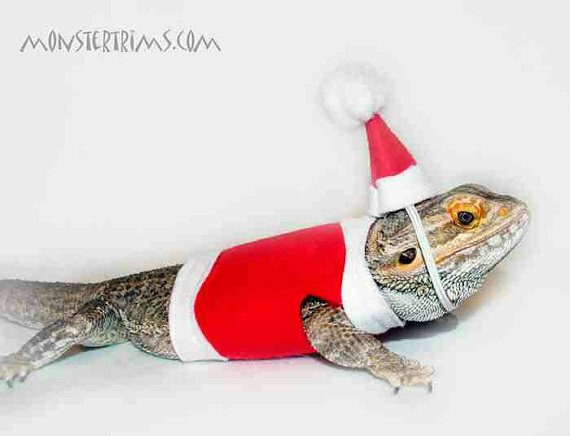 So when Christmas rolls around, dress your little guy up in this adorable bearded dragon Santa costume (available on Etsy). 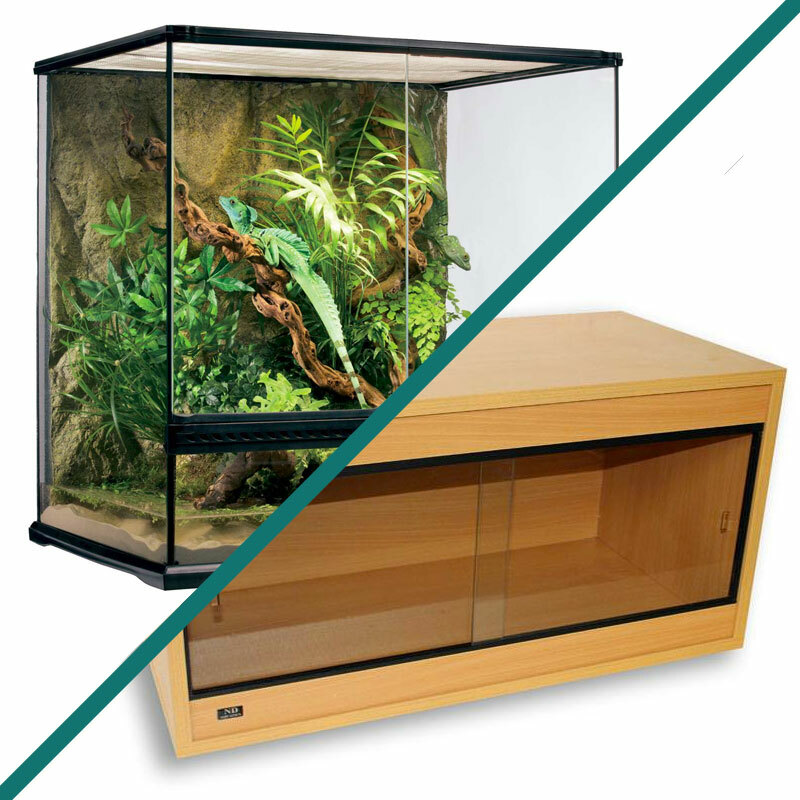 Got two bearded dragons? Dress one up as Santa and the other as Santa’s little helper! (Elf costume available here). 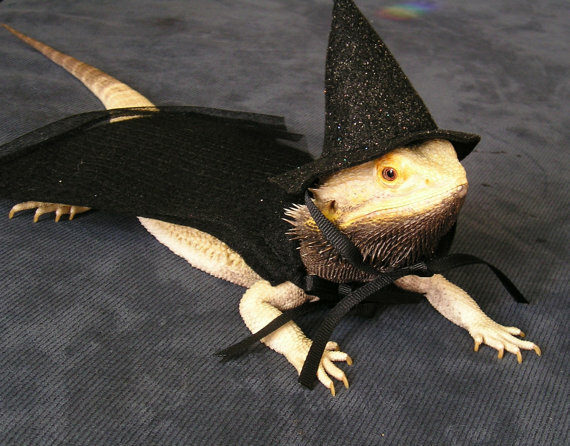 Looking for a Halloween costume for your bearded dragon? No problem! Dress him/her up in this adorable pumpkin outfit! (Get the costume here). 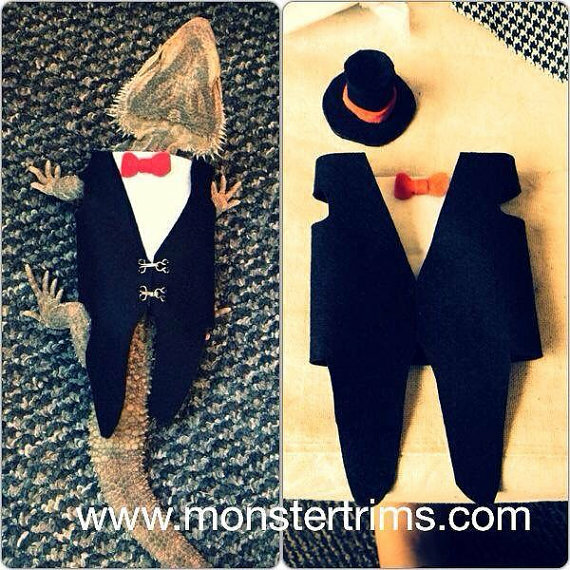 Here’s a costume for bearded dragons with style – a suit and tie! 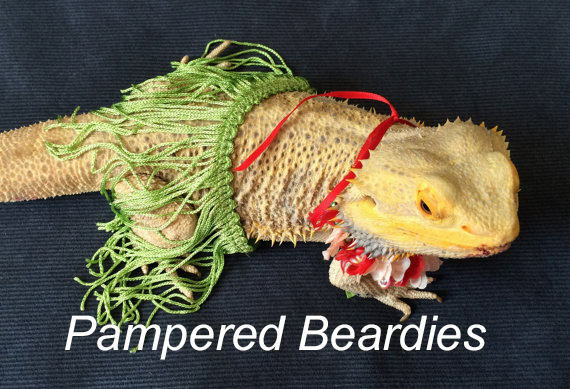 Because sometimes a bearded dragon’s just gotta look his best! (Pick up yours here). Hi my name is Lucy. 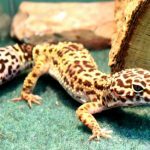 I make clothing for bearded dragons and other small animals. Here I am selling my tail coats and top hats. 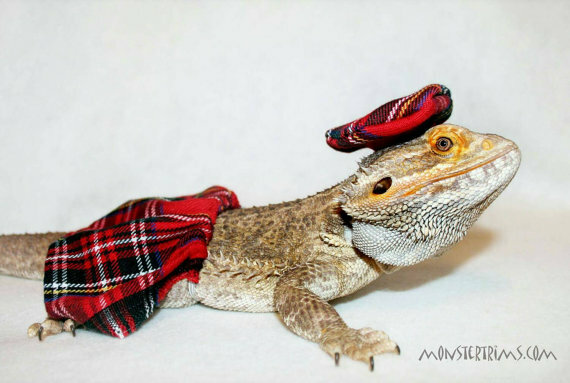 A Scottish kilt and a beret for a bearded dragon. You’ll think you’ve seen it all by now but you’re not even halfway through the post! (Pick up your costume here). 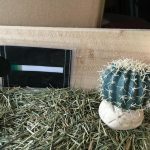 Everyone’s Irish on St Patrick’s Day – even bearded dragons! 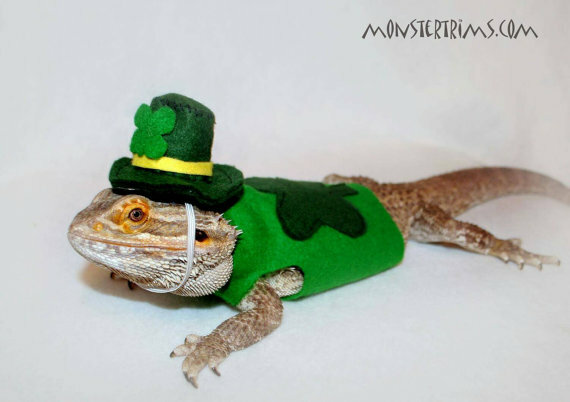 This cute costume even comes with a little hat to turn your little beardie into a little leprechaun. (Get the costume here). Hi my name is Lucy. I sell clothing for bearded dragons and other small animals. This is my St Patrick's day outfit with matching hat. Easter coming up soon? Hop to it and dress up your bearded dragon in this super cute rabbit costume. (Available on Etsy). Love Star Wars, you do? 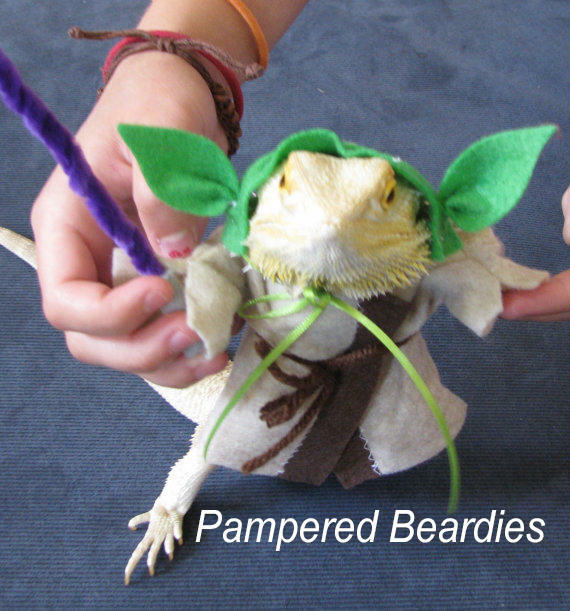 Dress up your bearded dragon, you must! Pick up this adorable Yoda costume on Etsy. Yoda Costume for Bearded Dragon with Plastic Lightsaber! Now with two sizes! 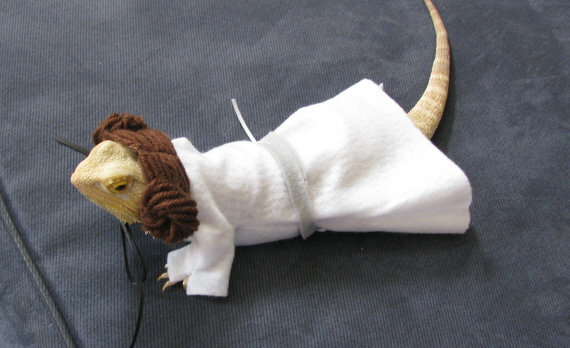 Here’s another one for the Star Wars fans out there – a Princess Leia bearded dragon costume! You’ve probably seen this one a lot on Pinterest and here’s where you can get it. Princess Leia Costume for Bearded Dragons with Plastic Light Saber! One size fits most. 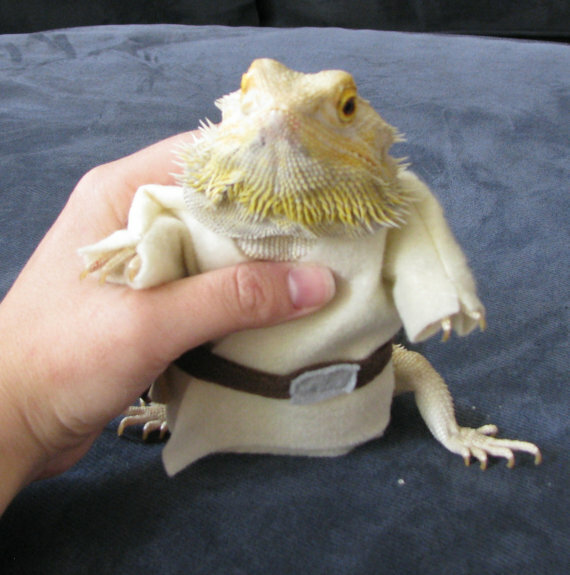 Yes, there’s a bearded dragon costume for pretty much every Star Wars character! If you’re big into Star Wars, pick up this Luke Skywalker outfit your bearded dragon here. Young Luke Skywalker Costume for Bearded Dragons with Plastic Lightsaber! One size fits most. 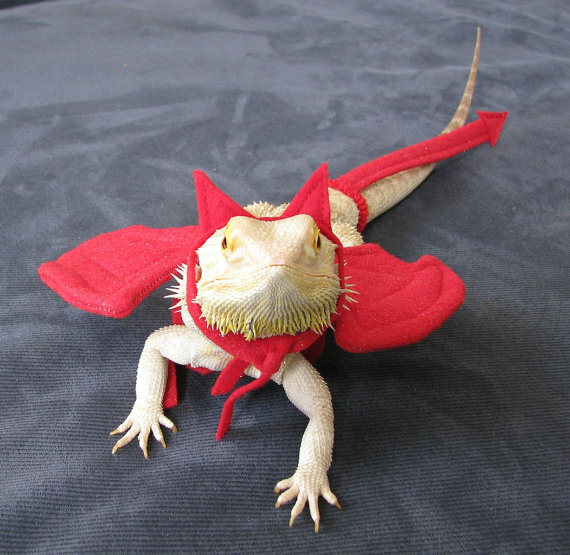 Here’s another Halloween costume for a bearded dragon – a devil outfit! 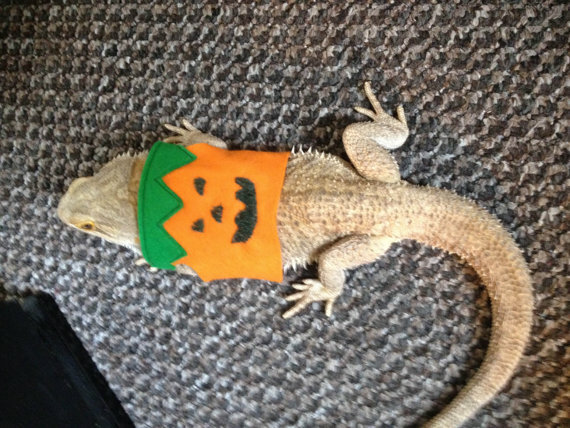 Because you wouldn’t want your bearded dragon to miss out on all the Halloween fun now would you? (Get the costume here). We told you you hadn’t seen it all yet – this Mexican fiesta costume includes a sombrero that’s just the right size for a bearded dragon! (Pick yours up on Etsy). 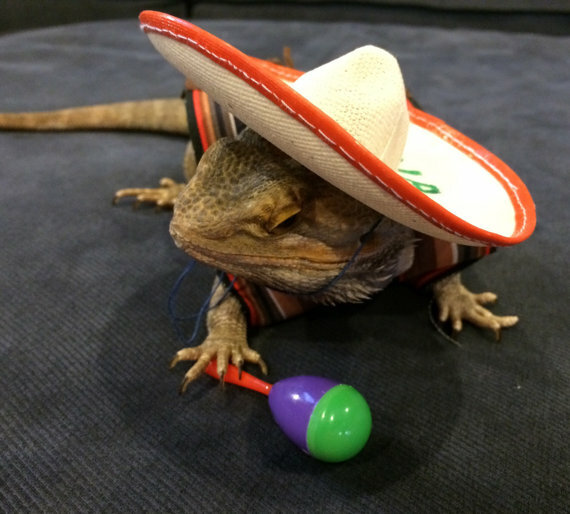 Mexican Fiesta Costume for Bearded Dragons! Two Sizes, one style. Feeling tropical? Now your bearded dragon can celebrate summer in style with a grass skirt and a lei! (Get the costume here). Aloha! Flower Lei and "Grass" Skirt Costume for your Bearded Dragon! One size fits most. 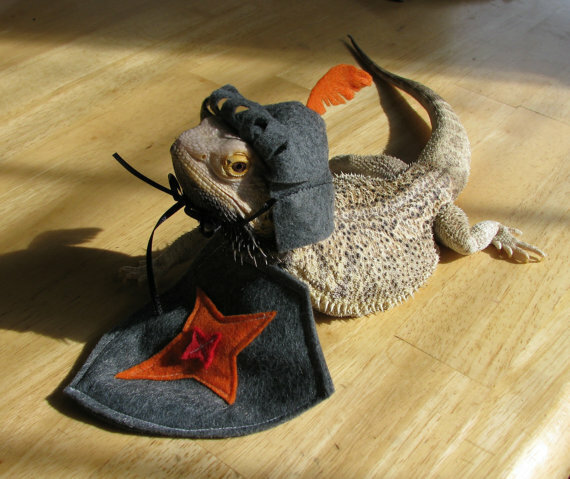 If your bearded dragon is your hero, dress him up in this cute knight in shining armour costume! 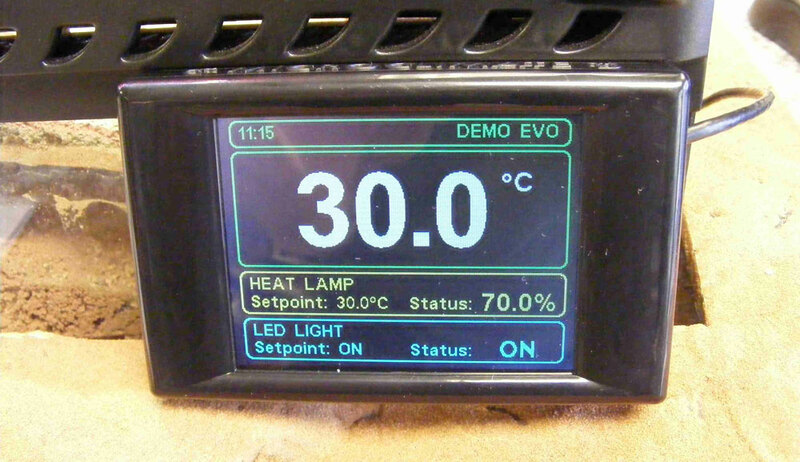 (Available here). Knight in Shining Armor Costume for Bearded Dragons! One size fits most. Any Harry Potter fans out there? Your bearded dragon will look all set to board the train to Hogwarts in this adorable wizard costume! (Available here). Wizarding Hat & Cape for Bearded Dragons! One size fits most. Let your bearded dragon celebrate one of your biggest achievements with you with this adorable graduation cap and gown – made just the right size for your little fella! Graduation Cap & Gown for Bearded Dragons with Custom Tassels! Two gown colors, one size fits most. Last but not least, it’s Superman! No actually, it’s your bearded dragon but this custom-size Superman cape makes him look just like him! (Pick up this costume on Etsy). 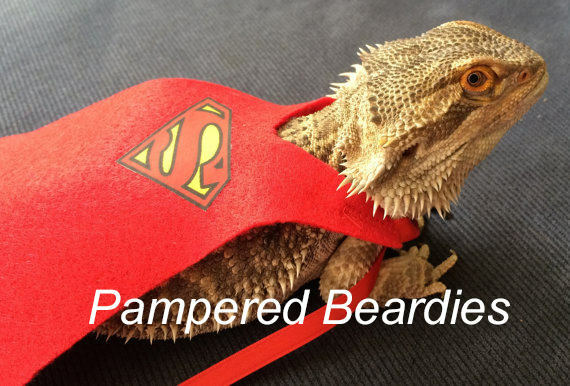 Super Hero Capes for Bearded dragons! Superman, Supergirl, Batman, Batgirl. Two sizes. And that’s a wrap! 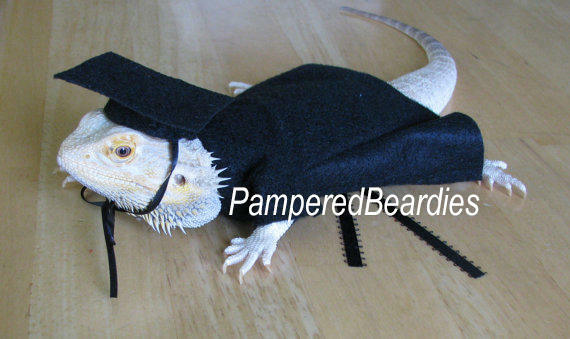 A big shout out to the Pampered Beardies Etsy shop where we found most of these costumes. For anything and everything you need to know about bearded dragons, stay on our blog!